Kieron Adrian Pollard (born 12 May 1987) is a Trinidadian cricketer who plays for the West Indies. An aggressive all-rounder, Pollard provides Slow Medium pace bowling and big-hitting from the middle-order. After shining during the 2009 Champions League, he was signed by both the Southern Redbacks and Somerset for their domestic Twenty20 campaigns. He was the joint highest paid player in the 2010 Indian Premier League, playing for Mumbai Indians. He was not selected for the west indies team in ICC WT20 held in India. But, his 2016 career had been more affirmative and aggressive. He was named in the 15 member squad against 2016 Pakistan tour. Pollard was born in Trinidad and Tobago, where he was raised, along with two younger sisters, in a poor home by his single mother. He also has a younger brother named Rithesh Suvarna. Speaking about it, Pollard reflects "It was pretty tough, it wasn't ideal getting up and your mum say 'We only have X amount of money'." After representing Trinidad and Tobago in the 2005 TCL Group West Indies Under-19 Challenge, he was selected as part of the West Indies Under-19 cricket team to tour Pakistan. Pollard top-scored for the West Indies in the first youth One Day International (ODI), scoring 53 runs off 49 balls. Pollard made another half-century in the second match, but didn't manage to make double figures in either of last two games. He was named in the West Indies squad for the 2006 U/19 Cricket World Cup, held in Sri Lanka, where he only managed to make 19–runs in his four innings, though he did manage to take two wickets in a defeat to Australia. During the 2006 English season he came to England to play for Haxey CC in Lincolnshire; he played five games for the club before he was recalled by Trinidad and Tobago to play in the Stanford Twenty20. Pollard made his senior debut for Trinidad and Tobago in the twenty20 competition against the Cayman Islands in July 2006. He finished the tournament with a respectable return of six wickets, and starred in the semi-final against Nevis, scoring 83 runs off just 38 balls, an innings which included 7 sixes to book Trinidad and Tobago's place in the final. He made his first-class debut six months later against Barbados, and marked the occasion with a century. As in the Twenty20, his innings contained a large number of boundaries, with 86 of his 126 runs coming from either fours or sixes. A score of 46 not out on his List A debut ensured that Pollard was in the selector's minds for the upcoming World Cup, and he described it as "a dream come true" when he was selected in the provisional 30-man squad for the tournament. Pollard's "dream run" continued with half-centuries in both four-day and 50-over matches against Guyana, followed by his second first-class century, coming against the Leeward Islands. Against Jamaica, Pollard showed his bowling ability, claiming four wickets in his seven overs to claim his fifth man of the match award in his 15th senior match. Trinidad and Tobago remained unbeaten in the 2006–07 KFC Cup, beating Windward Islands in the final to claim the trophy. Pollard finished as the competition's leading run-scorer, making 261 runs from his seven innings at an average of over 40. 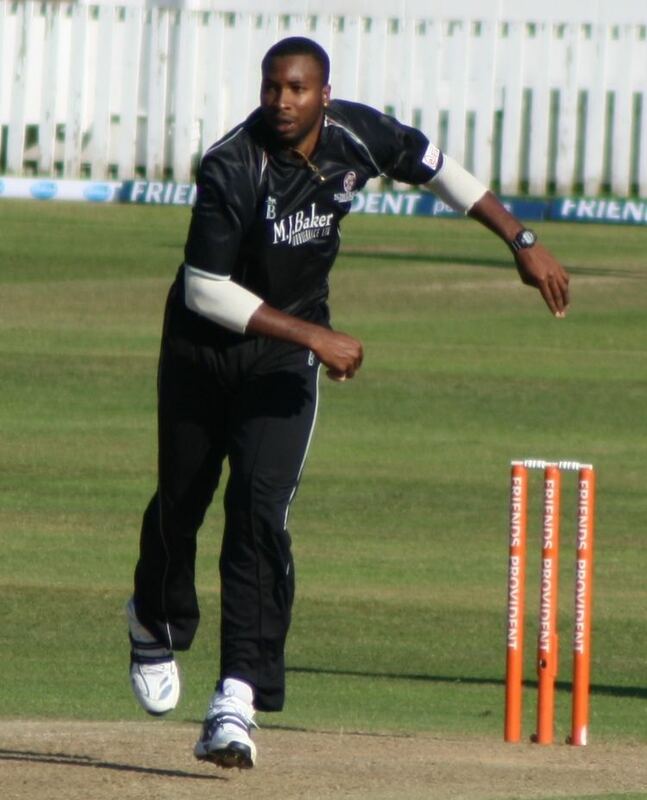 The 2008–09 West Indies Cricket Board Cup saw an improvement in Pollard's bowling, as he claimed nine wickets in the competition with a bowling average of 14.22. An all-round performance against Jamaica in the semi-finals, in which he took three wickets and made 76, earnt Trinidad and Tobago a place in the final, and Pollard the man of the match award. In the 2009 Champions league T-20 for Trinidad & Tobago, Pollard hit 54 runs in just 18 balls in the 15th match against New South Wales in Hyderabad. This earned the man of the match award and his side a crucial win. His display of hitting was so impressive that NSW approached Pollard after the game and attempted to sign him for themselves. Pollard also represents the South Australian Redbacks in the KFC Twenty20 Big Bash. He also signed for Somerset County Cricket Club for the 2010 Friends Provident t20. Although named in the provisional 30-man squad for the 2007 ICC World Twenty20, Pollard failed to make the cut for the tournament. The absence of Pollard and Lendl Simmons from the West Indies performance squad in 2007–08 was described as "baffling" by Tony Cozier, describing how the pair "had been seemingly identified as among those for the future but have quickly been shunted aside." Pollard was disappointing as Trinidad and Tobago won the 2007–08 Stanford Twenty20, averaging nine from his three innings. Pollard was recalled to the West Indies ODI squad for the series against Sri Lanka. The match was rained off after 18.2 overs of the West Indian run-chase with Pollard not required to bat. He retained his place in the squad for the home series against Australia, but after scores of 11 and 0 in the first two matches, he was dropped for the final three. Despite his poor form in the previous season's Stanford Twenty20, Pollard was named as part of the initial 32-member Stanford Superstars Twenty20 squad. The squad would provide the starters for the US$20 million winner-takes-all match against England later in the year. After a series of practice matches, Pollard was included in the team for the warm-up match against his Trinidad and Tobago side, where he made 24 runs off 14 balls and claimed the wicket of captain Daren Ganga. He followed this up with a nine-ball 27 against Middlesex, including three consecutive sixes in the last over. In the final, Pollard claimed the wickets of Andrew Flintoff and Luke Wright to help limit England to a total of 99, which Super Stars openers Chris Gayle and Andre Fletcher chased down in 12.4 overs. Pollard's impressive performance in the 2009 Champions League Twenty20 and the Big Bash led to him being one of the most sought after players at the 2010 IPL auction. After some aggressive bidding, the Chennai Super Kings, Kolkata Knight Riders, Mumbai Indians and Royal Challengers Bangalore all bid the maximum allowed; $750,000. A 'silent-tiebreaker' was won by the Mumbai Indians. 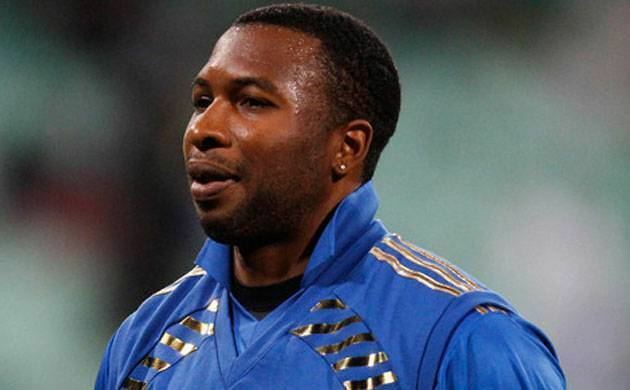 Kieron Pollard made his debut for Mumbai Indians on 17 March 2010 against the Delhi Daredevils at Feroz Shah Kotla in Delhi.It took a while for him to get off the blocks in his very first season. He however proved his moneys worth in the latter stages of the tournament with a blistering 13 ball 45 laced with 5 sixes and accounted for 2 run outs earning him his first MOTM performance. This was followed by a stellar performance against the Royal Challengers Banagalore in the semi final. 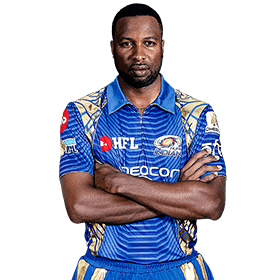 Pollard smashed a quick fire 33* off 13 balls with 3 sixes and followed it up with 3 wickets and 1 run out.He was adjudged man of the match and his efforts propelled Mumbai Indians into the final for the very first time where they eventually lost to the Chennai Super Kings. 2010 season was followed by 2 mediocre seasons for Pollard. In 2011 the only highlight was his brilliance in the field. In 2012 a sole Man of the match performance against Rajasthan Royals where he smashed a 33 ball 64 with 6 4s and 4 6s and followed it up with a career best 4-44in the 2nd innings. Pollard started the season strongly with a stellar knock of 57*off 38 balls with 5 sixes when Mumbai had lost. in the 2nd innings he picked up 1 wicket and a superb catch of MS Dhoni ensured Mumbai Indians victory. He was adjudged MOTM for his all round performance. Against the Royal Challengers Bangalore he propelled Mumbai to a competitive score with a 16 ball-34. Arguably one of Pollards best performances came against the Sunsrisers Hyderabad. With over 60 odd runs to chase in 4 overs pollard joined skipper Rohit Sharma and lit the Wankhede up with a splendid 66* off 27 balls.He hit 6 sixes in a span of 7 balls and led Mumbai to an emphatic victory. 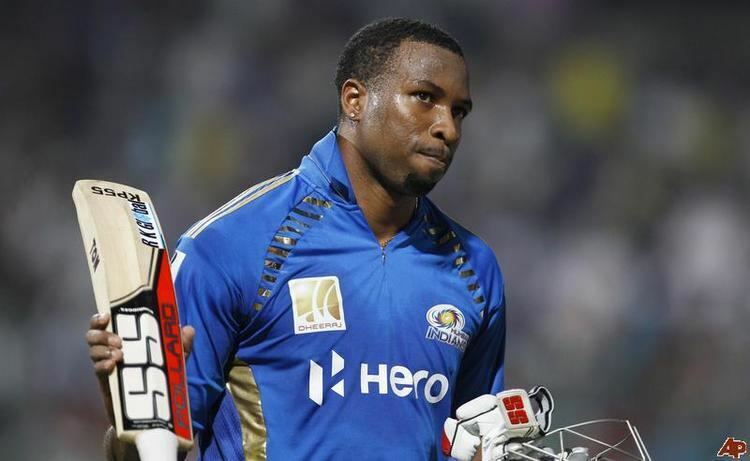 Pollard saved his best performance for the Final against Chennai.With Mumbai reeling at 52–4 Pollard fought back with a 60* of 32 balls to lead Mumbai to a competitive score of 148. In the 2nd innings he picked 1 wicket and Mumbai won their 1st IPL Title. Mumbai Indians got of to a disastrous start losing their first five games in UAE. Pollard smashed 78 off 48 balls whilst chasing against SRH but he was dismissed by Irfan Pathan in the last over and Mumbai eventually lost the match. In the first game at Wankhede against Punjab Pollard chipped in with a crucial 28 off just 12 balls and helped Mumbai register their first win of the season. This can be rightly called as Pollard's best season till date. Similar to 2014 Mumbai had a forgettable start to the season managing only 1 win out of the first 6 matches. 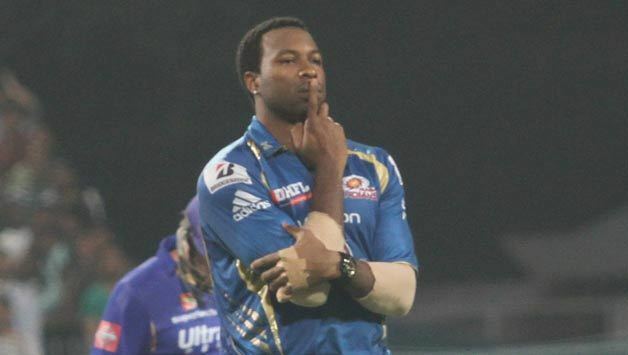 Pollard struck 70 runs off 48 balls with 7 boundaries and 5 sixes against Rajasthan but Mumbai lost the match. He followed it up with another 64 runs off just 34 balls smashing 5 sixes against Chennai but again Mumbai were unable to defend their total. Chasing against the Delhi Daredevils Pollard joined Rayudu and smashed a quck-fire 26* off just 14 balls and ensured victory. In the same week he smashed 49 off just 24 balls with 6 sixes but Mumbai were unable to chase RCB's mammoth total. In a must win game against Kolkata Pollard played a patient knock with Hardik Pandya and helped Mumbai reach 171. Yususf Pathan led the KKR chase with a brilliant half century and the equation was 12 runs required off the final over. Pollard with ball in his hand dismissed Pathan on the very first ball, conceded 6 runs in the next 2 balls but followed it up with 3 dot balls to help Mumbai to a crucial victory. In the first qualifier at Wankhede against the Super Kings Pollard helped Mumbai post a massive total of 187 with 17 ball 41 with 5 sixes and helped Mumbai reach the final. In the final against the same opposition at Eden Gardens, Pollard added 36 of just 18 balls and helped MI reach a massive total of 202. Mumbai Indians defeated Chennai to win their 2nd IPL title. Pollard ended the tournament with 419 runs at SR of 163 and 28 sixes. After his impressive performance at Indian Premier League for the Mumbai Indians, the West Indian all-rounder was picked in the West Indian squad for 2010 ICC World Twenty20. Pollard had a successful 2010 Friends Provident t20 for Somerset, helping them to the final of the competition on 14 August 2010. He scored 354 runs during the competition at 32.18 – the second highest Somerset batting average – including two half centuries at a strike rate of 175.24 runs per 100 balls. He also took 29 wickets at 15.10, second among all Somerset's bowlers. He took an impressive catch on the boundary in the semi final against Nottinghamshire, and then scored 22 from seven balls in the final match against Hampshire, including two sixes and a four, before Dominic Cork injured him with a bouncer that required hospital treatment. On the back of Pollard's domestic performance he was offered a central contract which he turned down because that would force him to be available for West Indies selection all the time and Pollard wanted to play Twenty20 cricket as well. Despite this his good performances meant that he was selected for the West Indies in the ODI and Twenty20 series against Sri Lanka as several high-profile names such as Denesh Ramdin and Ramnaresh Sarwan had been dropped. Pollard was bought by Karachi Kings for US$140,000 in 2017 Pakistan Super League players draft.He in a do or die match against Lahore Qalandars scored 45 runs of 20 balls to help his team to stay in the tournament, later he was adjudged man of the match.